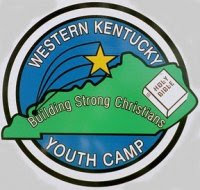 One of my favorite places in the world is West KY Youth Camp. The camp began in the early 60s but the first time I attended was in the mid 70s. I was around five years old at the time. My father was director that week and my mother was a counselor. I can still remember sitting on the front steps of that little cabin and being toted around by the older kids. I began attending the camp alone when I was 8 and was a Bible class teacher in my late teens. A few years ago, I was asked to join the staff. I look forward to this week every year. Meeting new kids, working alongside other Christians, and just being at the camp is one of the most enjoyable parts of my summer. There are few places in this world where I can walk in the footsteps of my parents. Since they both passed away when I was a kid, being there and walking around the camp brings back several good memories. My parents loved that camp and I’m thankful that my children and I have been able to be a part of it. Hearing a hundred or so young people sing Amazing Grace, Farther Along, Sing and Be Happy, or Light the Fire (to name a few) will give you chills. There is nothing more beautiful than hearing these kids lift their voice in praise. The problems of this world seem to pass away when you’re at church camp. Sure, there is still oil in the Gulf, tension in the Middle East, and political hoopla in the news, but for a few days those troubles don’t consume us. Camp gives us time to refocus our lives and hearts around Jesus. 4. Someone is always laughing. Laughter is everywhere! Kids are having fun. Adults are relaxing. Good memories are being made. Fun abounds and whether they’re popping 4000+ water balloons, getting their counselors out at Star Wars (Dodge Ball), or just playing around, kids are happy. And when the kids are happy, the counselors are happy, and the world is a better place. 5. The food is great! Kudos to the kitchen staff! They go above and beyond to feed the kids and staff at camp. Just knowing that your kids will never go hungry at camp should help ease the tension some parents have about their kids being away for an entire week. Few things are as encouraging as being secluded from the world for a week with other people who love Jesus, His Church, and His Word and nothing is more rewarding than watching young people learn about God’s Word. Knowing that the future of the church is in the hands of these young people is comforting. The people at church camp aren’t free from problems. Our lives aren’t perfect. We’re not exempt from temptation. We don’t have all the answers but what we do have is a love for God, a love for your children, and a dedication to share our faith with others. I’m thankful for the people who had a dream to start this camp. I’m thankful for the people who donated the land and for every person who has devoted time, prayers, and money to help WKYC be the place it has become. And most of all, I’m thankful to God for allowing me to be a part of such a wonderful place. Do you have a favorite memory of church camp? Feel free to share here. Entry Filed under: church camp,the church of Christ,the church of God,the Lord's Church. Posted in church camp ,the church of Christ ,the church of God ,the Lord's Church . sounds like ya had fun! and it was a eye opener! I haven’t stopped by in a while, but it’s interesting that on the day I stop by, your top post is about church camp. I love church camp! My husband and I met at QMCC (Quartz Mountain Christian Camp located in Lone Wolf, OK) where he was a counselor and I was a camper. It was his uncle’s session. That 4th of July week has been in the Waugh/Trent family for many, many years and I’m excited that next year my husband is going to do the session for the first time. Church camp is great for kids, teens, and adults. Each Wed. night we go up for evening worship in the summer. Singing outdoors by the mountains is awesome, really.